I damaged Sonas, and it could have been a lot, lot worse! 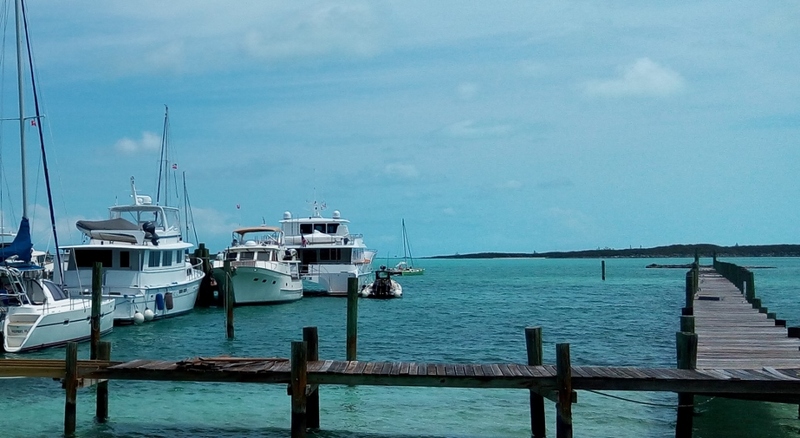 We had pulled into the Exuma Yacht Club in Georgetown to take on water and to pick up my brother and sister-in-law who had just flown in. We were tucked into the fuel dock, squeezed between two other vessels – see photo below from a similar set up at the same fuel dock the last time we were in there. After we had the water and our guests on board we were ready for the off. I turned on the engines and all of the instruments. Then stepped off the boat to pay for the water. After paying I went back on board and as I entered the pilothouse I called to the two dock hands to go ahead and free the lines. I walked up the six steps to the flybridge, had a look to make sure that the lines were clear, and put the starboard engine into reverse to take my starboard stern out first to go around the boat behind me. I looked down and realized that I had not turned on the engine controls – which are on a separate switch on the pilot house panel. No real panic, the boat wasn’t moving. I put the control back into neutral and stepped back into the pilot house and switched on the controls. The controls in the pilot house blinked on as active. I quickly went back to the flybridge and pressed “active” twice on the controls and “warm sync” once to give me control, and immediately put the starboard engine into reverse, and the stern started moving out. I then put the starboard engine back into neutral so as to slow the maneuver down – and the starboard engine kept right on going! I quickly tried again with the control, into reverse and back to neutral, no good. Sian then told me through our headsets that we had cleared the boat behind us, I could now straighten up so the bow wouldn’t hit that boat. She of course wasn’t aware of the issue. I decided to go ahead and put the port engine into reverse and goose it a bit and that would straighten the boat up so that I could at least avoid the boat behind us. Then we could exit the marina, turn off the engines and sort out the issue. Except the port engine would not respond to the controls either and stayed in neutral! Sonas was going astern and pulling to the left and the bow was swinging to the right towards the boat behind us. So I quickly hit the bow thruster taking the bow to the left and straightened her out that way. That took us past the other vessel but still yawing to the left going astern. I put as much urgency into my voice as I could and told Sian to drop the anchor quickly. Without as much as a comment she ran to the bow and did that. I ran to the pilothouse to kill the engines, just as she told me that we were about to hit the dock behind us, and a second or two later we did, striking our swim platform against a piling, where my brother stuck on a fender and line. With that, the engines off and the anchor out we were stopped, albeit it at an angle across the marina fairway. I then went to start the engines again to see if I still had an issue, and the starboard engine would not start. With all of the controls in neutral and the engines off I went into the engine room to see what was going on. I immediately saw that the starboard engine transmission was in reverse (why the engine would not start) and the port in neutral. Yet the controls were both set to neutral. I then realized what I had done. I went back to the pilothouse and turned off the power switch to the controls, waited about twenty seconds, and turned them back on. I went back into the engine room and both transmissions were now in neutral and responding to the controls. I went back up top and reassured everyone that I had identified what had both caused the issue and the resolution. I started both engines, give them a little bump in gear to confirm all was well. We raised the anchor, released the stern and left the marina. Sian went back and checked the swim platform and reported damage, though pretty cosmetic along the stern rub rail. Thinking over it afterwards I realized how fortunate we were that the dock to our left side was completely empty due to damage last year from Hurricane Matthew, and that no other boat or dinghy was coming up the fairway at the time, though I wouldn’t have started leaving if that were the case. I was also relieved that no one on board our vessel had tried to get between the boat and dock. I also thought about what I could have done differently to avoid this (apart from the obvious of making sure that the controls were switched on along with the other electronics). Should I have waited until at the flybridge controls before calling for the lines to be released? I don’t think that would have helped because I would not have looked to engage the engine until after the lines were free, so I would have had the same result. So what caused this issue? 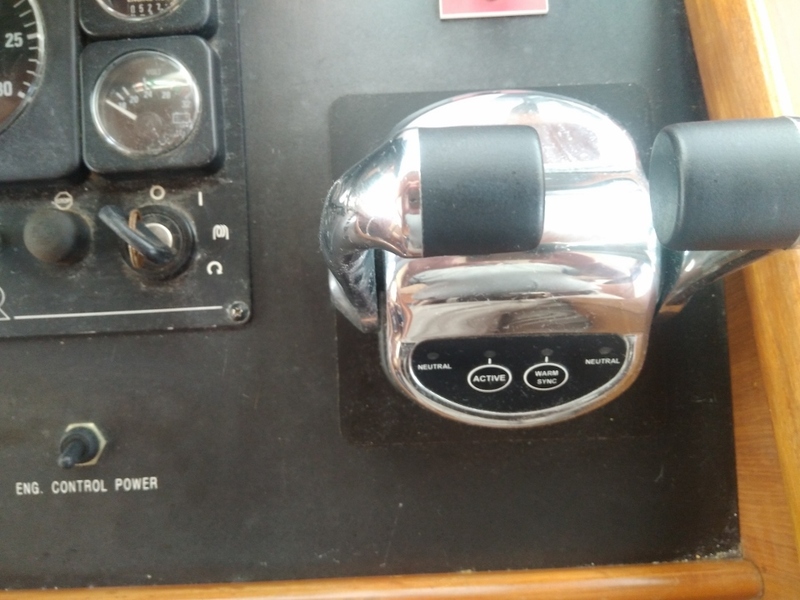 When I ran down and turned on the power switch for the controls in the pilothouse, the controls in the pilothouse are activated. I then went quickly up top and activated the upper control and at the same time threw the starboard engine into reverse. The engine responded, but because I did not wait for even a second after activating to sending an order, I believe I confused the electronic Glendinning control system. Either it was caught between the two sets of controls or somehow, after I gave the reverse order, it reverted to the pilothouse controls. The fact that the starboard engine transmission stayed in reverse after I had the engines off and both sets of controls in neutral seems to indicate that I confused the electronics by not waiting a couple of seconds for the upper station to pair with the units in the engine room. So now I make sure to check the power is turned on along with the other electronics AND I wait a few seconds after transferring the controls before I change gear. I have no issues with the controls since. Reading the Glendinning manual it does not mention a wait period, though it does say that you can have the gears for the set you are transferring to already in the position you want before activating so as not to lose RPMs. Thank goodness no real damage, (except to pride!) I bet it will not happen again!!! Glad all is well, see you soon. Nice job, Captain, and hey, how about that crew! Great teamwork, folks. A great story. Yes, a lesson learned that we all must learn. Just recently I had the damage repaired to my swim platform that I had caused on the second day we had Dauntless. I did not repair the minor damage (like yours) because it served as a reminder for me. Regardless of the size of the vessel, there are certain steps that can be incorporated into S.O.P.’s (Standard Operating Procedures), some of which are universal, some of which may be unique to your particular vessel, which can greatly reduce the burden of keeping track of every little individual detail we seemingly need to pay attention to as operators day to day. Want to take something off your mental plate? Lighten your load? Just make it an S.O.P. Big boats have tons of them. Whether on a big boat or small, clear written, or mentalized, S.O.P.’s are routines that serve as safety buffers, which can eliminate, or greatly mitigate problems leading to incidents like this, often before they arise. #1 – Complete all pre-departure equipment/system checks. #2 – Verify neutral-indicated control positions prior to start up, at ALL control stations. #3 – Verify no swimmers/divers in area before start up & start mains/all underway systems. Verify neutral, post-start up. #4 – Verify dock lines still SECURE (all slack out of springs) & your Deck and Marina Dock crew are ready, but standing by for departure – clearly confirm both verbally/visually. TELL Dockhands to STAND BY/LEAVE LINES SECURE for a minute, while you run a couple checks before departure. #5 – With the vessel SECURED to the dock, bump (2 seconds) the gears: clutch forward, pause; back to neutral, pause; clutch reverse, pause; back to neutral – separately, for each engine, to verify proper control engagement/disengagement. #7 – And the one pre-departure check MANY skippers neglect: ALWAYS CHECK your STEERING! Turn your wheel lock to lock, verifying function, smooth operation and full range of motion on your rudder angle indicator. Return to CENTER. If all these systems pass 5 by 5, you’re good to go. 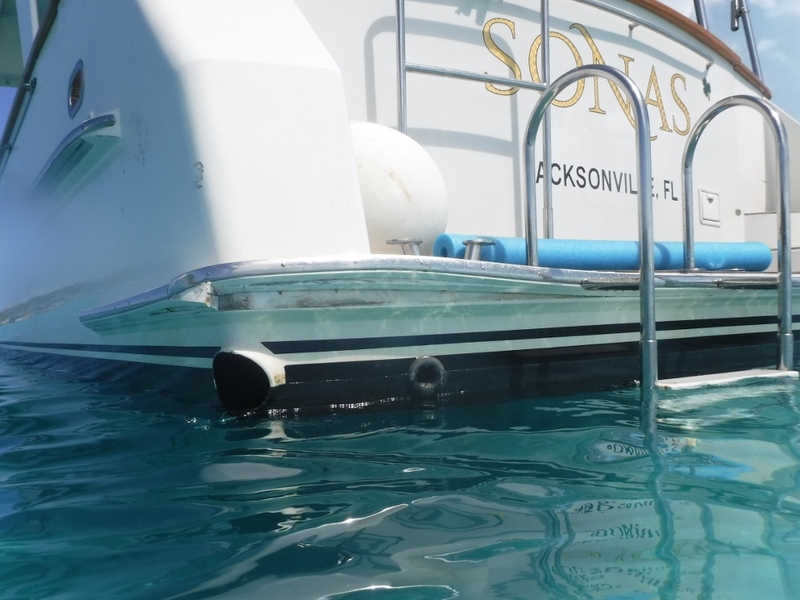 If however, you’ve discovered ANY control issues with this simple S.O.P., you’re still safely secured to the dock, damage free, no injuries and ready to begin troubleshooting. As you already learned, nothing is worth rushing so much – there’s always time for safety. Noteworthy: When returning to port/dock, or prior to entering a narrow fairway, it’s never a bad idea to re-check these systems PRIOR TO getting back into close-quarters maneuvering. Exactly when you NEED it, is NOT the time to discover you DON’T HAVE it! I have not written this to offend at all and I sincerely hope anyone who reads finds it helpful. P.S: ALWAYS know where your EMERGENCY STOP controls are for every piece of machinery/equipment and be prepared to use them without hesitation, if needed, to prevent or reduce injury/damage. If control failure occurs; corrective control recovery action fails, then an emergency shutdown option should be on your short-list of choices, if circumstances make it prudent.